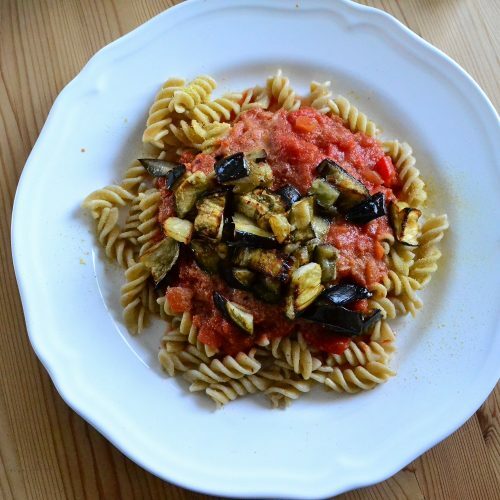 Vegan pasta with vodka sauce and roasted aubergine. There is a lot of discussions online about vodka sauce. Is it a gimmick or not, does it give any flavor, what is the point, etc. etc. I personally think there is a point and it is certainly not a gimmick. Tomatoes and bell peppers contain flavour compounds that are alcohol soluble, which means they only release these flavours when mixed with alcohol. This is the reason why wine is often added to tomato based dishes. Comparing to wine, vodka is colourless and has a different taste, so it is more suitable for sauces where tomatoes are mixed with cream, like it is in this recipe (coconut cream). It does add a bit of different flavour too if added at the end of cooking process. Vodka gives the sauce peppery flavour and will enhance other spicy flavours, from chilies for example. Because vodka is usually added at the end of cooking, the dish will retain some alcohol. Of course three tablespoons, like here, and up to a quarter cup per 800ml of sauce will not make anyone drunk, so personally, I think it is OK for pregnant ladies and children. However, it might not be OK for drivers if the country have zero alcohol while driving policy, like here in Norway, where people even advised not to drink some medicines that contain alcohol. 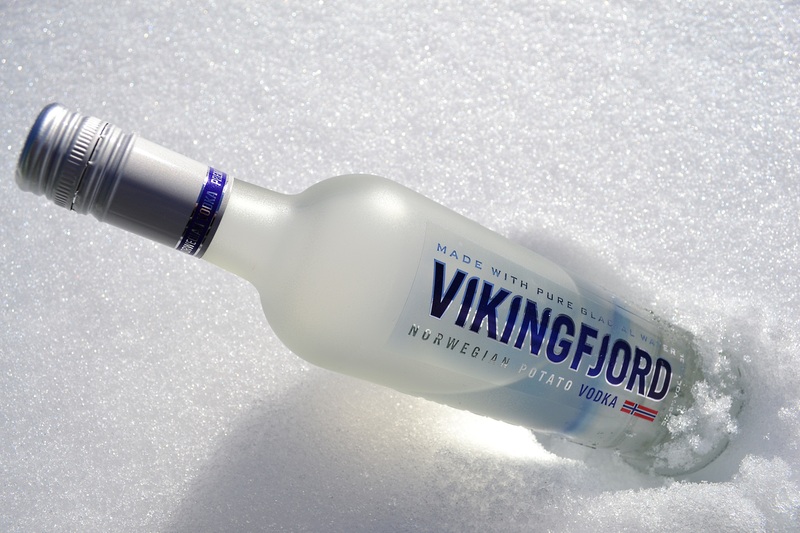 I use Norwegian potato vodka here. It is vegan and it has milder taste and smell comparing to the Russian one I also have. a) it is almost always comes in a glass bottle and I prefer glass to metal boxes for purity. b) it is almost always completely free of salt and any other ingredients. Just pressed tomatoes. 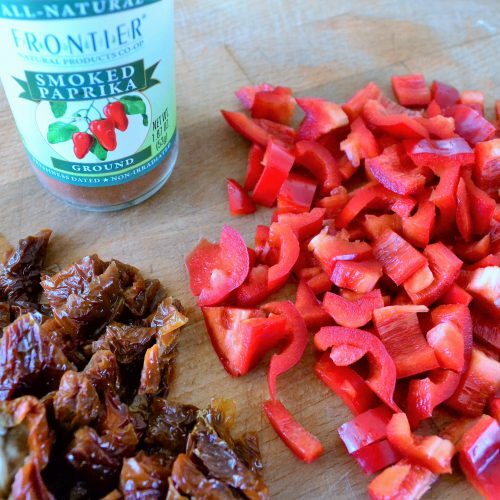 I prefer to use oil free sun dried tomatoes, because they could be used in wider variety of dishes (not every dish requires oil) and they are additive free. I use organic, full fat coconut milk, that turns into thick cream when stored in refrigerator. I love Swedish Anglamark brand, it is clean and tastes fantastic. 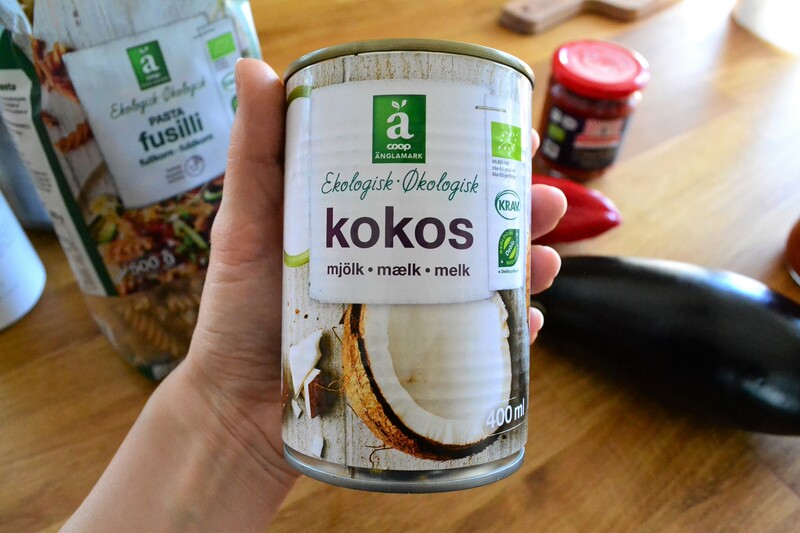 Seriously, the best coconut milk on Norwegian market. 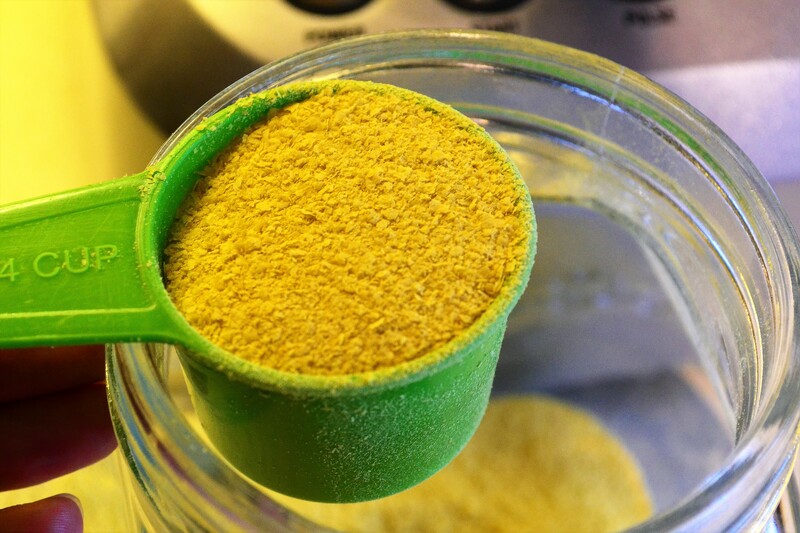 I love using nutritional yeast flakes in vegan recipes, because it give dishes cheesy flavour with a bonus of extra B vitamins. 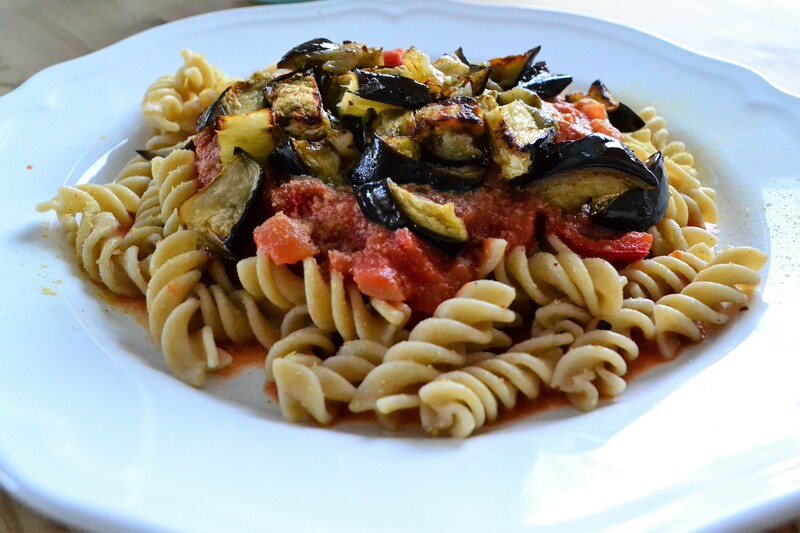 Pasta with delicious creamy sauce and soft roasted aubergines. Vegan comfort food. 350 g (3/4 bag) of dried pasta shapes. 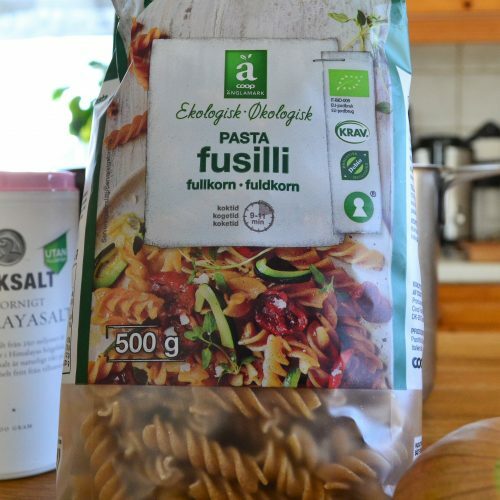 I've used wholegrain organic fusili. 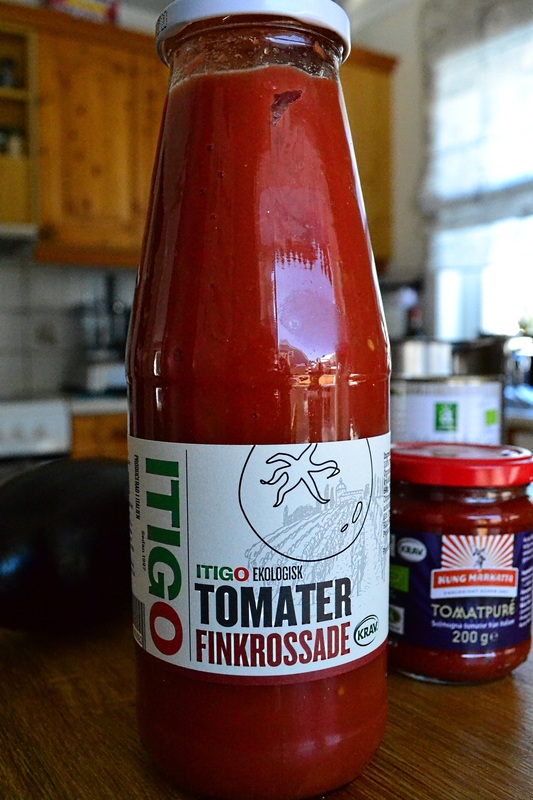 500-700 ml (depending on the amount of sauce you want to make) organic passata, salt free. 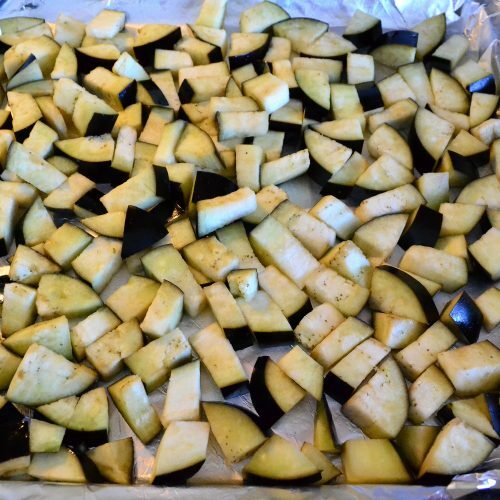 Arrange aubergines on the shallow baking tray. * Toss in oil and salt and roast at 180C until very soft and brown. 15-18 minutes. Bring a saucepan of salted water to a boil. Add the pasta and cook according to instruction on the bag. I've used wholegrain pasta, which takes 10 minutes to boil. Remove a ¼ cup of cooking water and set aside. Drain pasta in a colander, place it back into the pan with a tablespoon of butter, mix and set aside. 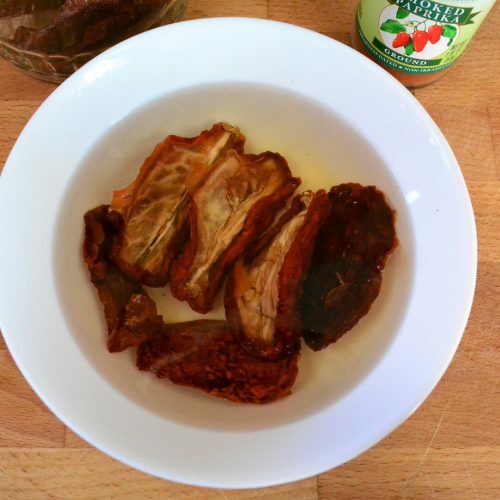 Meanwhile, pour boiling water over your sun dried tomatoes to re-hydrate them a bit. About 10 minutes is enough. Remove from water and chop finely. In a medium saucepan, fry onions in oil until translucent. Reduce the heat to low, add chopped paprika and sun dried tomatoes, a dash of smoked paprika and pasta water, cover and cook until paprika is soft. Press garlic into the sauce, add passata and the tomato paste. Increase the heat to medium and cook, stirring, until thick and bubbling about 2 minutes. Add the vodka and cook for another couple of minutes, then stir in the coconut milk, cook for another 2 minutes. Pour the sauce over the pasta to coat. Serve immediately, with salt and pepper, topped with nutritional yeast flakes, aubergines, olive oil and chili flakes. *You don't need to bathe aubergines in salt for this recipe, unless you know that your aubergines are the bitter kind. Nowadays, they are modified to be more palatable and most commercial growers produce this sort. Salt also draws moisture out of aubergine, but we are not going to marinade it here, so there's no need to lose the water.